GPS tracking for yacht racing, directly from you smartphone, broadcast on the web. The PredictWind Tracker allows you to track your position and movement with GPS directly from your smartphone using highly compressed mobile data (approx 1MB per race). Track and review your race or share your position with family and friends. Track your GPS location directly from your smartphone using wifi, or mobile networks. No extra equipment neccessary! Share your location with anyone using a unique webpage. Show friends and family your locaiton while offshore or share your race with coaches. Replay previous tracking online to analyse your race to see how you performed or share with friends and coaches. Enter your name. Select Club, Race and Division. 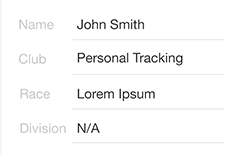 Alternatively select Personal Tracking. Personal tracks are stored for 2 days then incrementally deleted. Toggle tracking on and enable the Tracker to access location services in your phones settings. Select View Tracking from the bottom navigation to view your current tracking. Select only the club and race on the setup screen. On the map view, select the division to see all the tracks in real-time. Use the search box to find specific competitors. Turn off wifi & bluetooth to conserve battery. Close background apps to conserve power.